I used to read 2000 AD for years, off and on, and I’m doing it all over again. 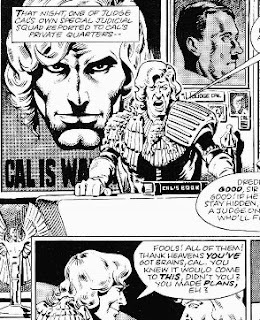 2000 AD is still going, but I’m reading those old issues of the comic from the late 70s and early 80s that I read as a kid. Unfortunately, I no longer have my old issues of the comic, but I found some scans of early 2000 ADs, which is even better because I can read them on my phone using Bubble, the comic book reader for Android 4.1+. It’s cool, rock solid on my phone, no adverts, and the source code is available under MIT license. If you are crazy enough to want to read these old comics too, just download the scans, put them on your phone and you can read them with Bubble. It may not be great for your eyes, but it is a lot of fun. This week I’m reading issue 87, and the cover is pleasantly savage. It’s a work by Belardinelli, whose dinosaurs are never going to make a paleontologist happy but, from a purely artistic point of view, look great. The veins in the neck of this beast are particularly powerful and organic looking. The prehistoric monster is going to be something of a star in the Flesh strip inside, and he is making his big entrance this week. 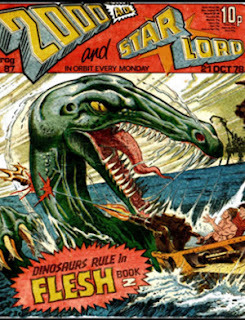 He is a kind of prehistoric Jaws character, menacing the human time travelers. After gazing for a while at the pleasantly pulpy front cover, it is time to open this baby up. The first story inside this issue is Judge Dredd. 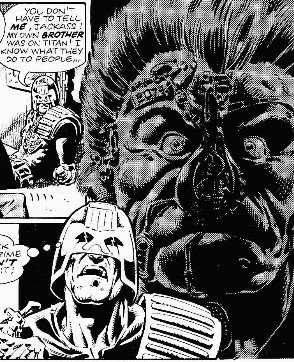 Dredd was accused of a crime last week and sentenced to a penal colony on Titan, the largest moon of Saturn. Dredd thinks about his brother, Rico, who was exiled there and turned into a cyborg monster. I’m not sure why, maybe cybernetics is the future equivalent of the prison tattoos of today. Understandably, Dredd decides it’s probably a good idea to escape. He breaks his chains and turns that shuttle around. 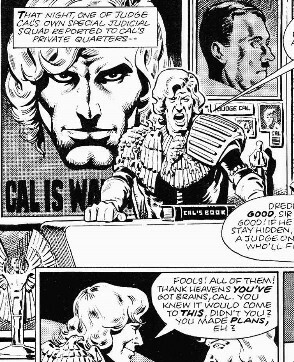 We are also shown more of Judge Cal in this strip, and it is made abundantly clear that Cal is the bad guy. There is even a portrait of Adolf Hitler on his wall, as a not-so-subtle indicator of how evil this guy is. I’m enjoying this story very much, and I know it will turn into the huge The Day the Law Died arc. It is one of the best Dredd stories ever told, for my money, and even these early stages are fun. Dave Gibbons does the art on Ro-Busters this week, and his disciplined and static style fits the story about robots beautifully. He draws a Rolls Royce Robot, for example, that looks expensive, shiny and great, like it was designed by Apple. 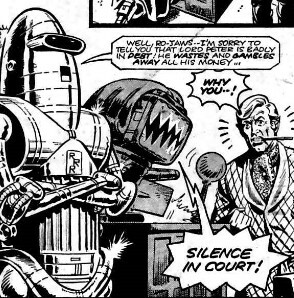 This week’s episode sees a robot court deciding the fate of a bunch of humans. The robots who work for each human are called as a character witness, and what they say will decide their masters’ fates. Obviously, all the humans have skeletons in the cupboard that their robots know about. Even though all the humans turn out to be bad, one of them is much worse that the others. He is killed by his own servant robot, meaning Ro-Jaws, one of the robot heroes of the strip, doesn’t have to pass judgement. This week’s episode of Flesh introduces us to Claw Carver, a blackguard with a dinosaur claw strapped on where his hand should be. The first we see of him, he is killing baby dinosaurs because the has decided to bury stolen money in their cave. I thought this scene was just to establish what a bag guy Claw is, but it turns out the father of these babies gets the scent of their killer, and vows the equivalent of dinosaur revenge. It’s like captain hook, if the crocodile was a dinosaur. 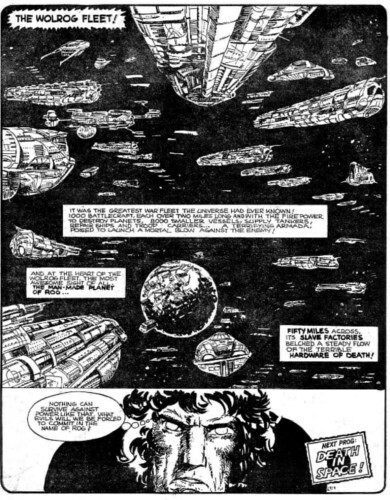 Next comes Strontium Dog, where a huge spaceship has engulfed the smaller craft that Johnny Alpha is traveling on. 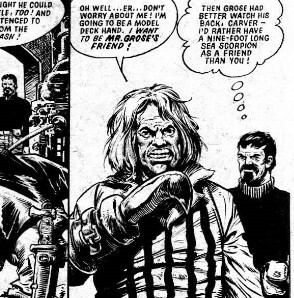 The art by Ezquerra is great, as usual. The passengers soon find out that the giant spaceship that has capture them is a Wolrog Empire ship. Johnny is press-ganged into the Wolrog military and there is promise of action ahead, as the Wolrogs get their fleet together, ready to invade innocent planets. We are left with Johnny worrying what the alien taskmasters who have captured him will have him do. We’ll find out in the next issue.